Let our qualified staff help bring to life something unique! Select from our menu or customize your own – whether it’s an elegant plated dinner or you’re looking for a laid-back beach menu, let us take the hassle out of it and take care of you and your guests. Visit the menu page to see some of our favorite dishes. Our intimate event space can host rehearsal dinners for up to 45 guests. Our services are inclusive – we provide bar service, staff and rentals such as tables, linens, plate ware and table décor. Hors d’oeuvres are a popular choice for any event. They are being used more often to help keep a party moving and allowing guests and hosts to mingle and socialize. By Design Catering has a professional staff, great chefs, and the attention to detail that allows the hosts to relax and enjoy themselves. From designing the menu, helping with the rental needs, decorations, and flowers, By Design Catering is there for you. I can't say enough good things about our recent experience with Tasha and her team at By Design Catering! Tasha was wonderful to work with as we planned a rehearsal dinner for 35 people for our son and daughter-in-law's destination wedding in St. Augustine. Not only was the food and venue perfect, but the staff was beyond courteous and friendly--they truly went above and beyond. With a large extended family and 4 grown children, we've planned and attended a number of special events over the years, and By Design Catering is right at the top of our list of great experiences. Hope to see you again, St. Augustine. Thank you By Design Catering for making our event at the Fountain Event a big success. Your suggestions made the event elegant and enjoyable for me and my guests. The food was beautifully presented and delicious. Looking forward to working with you in the future. I just can't praise Tasha and her crew enough!! Planning a destination wedding can be quite frustrating and Tasha took out the frustrating part when it came to the food. She created the PERFECT menu, exactly what we were looking for!! Everything was cooked to perfection and the flavors were amazing!! We are still hearing about how wonderful the food at our reception was!! I would definitely recommend By Design Catering...best experience ever!! Thank you again for all you did!! By Design Catering is owned by Marshall and Tasha Peters. They have enthusiasm and the expertise to exceed your expectations. Here’s a quick bit about them. Marshall is from Washington D.C. and comes from a military family. The melting pot he lived in helped shape his love for cooking. He graduated from Johnson and Wales and off he went spending his twenties bouncing down the east coast from Maryland to Charleston, landing in Jacksonville in 2000. Tasha spent her childhood traveling with her military family. The ethnically diverse military community was a great place to get exposure to cuisine that fuels creativity now. She also came to Jacksonville in 2000. 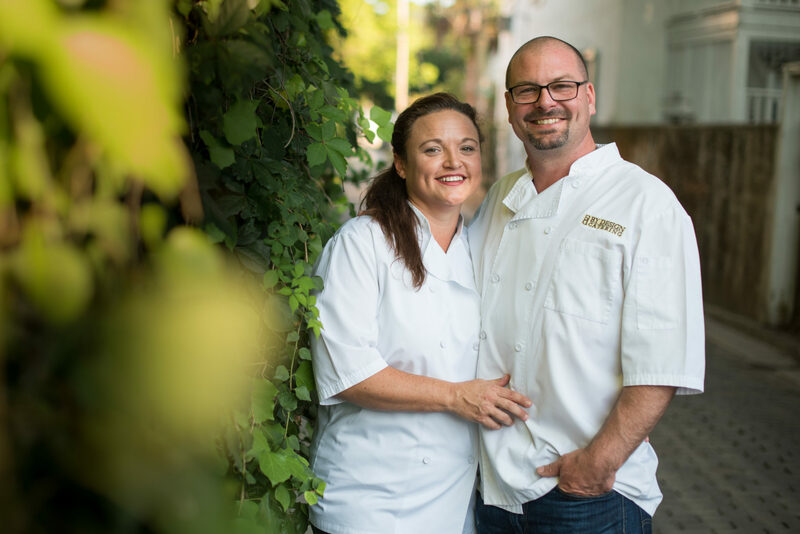 The two met while managing for the same restaurant, and fell in love. By Design Catering brings all the life and professional experience full circle. We love to collaborate with our clients to give them the perfect menu we can. The team at By Design Catering will take your inspiration and vision and design a menu that will wow you and your guests. By Design Catering always loves it when guests challenge us with the newest trends or something inspirational for them. The relationship between By Design Catering and our clients is the most important thing. We know planning an event can be very stressful. It’s been proven that hiring us helps relieve that stress.